Visited for many times during my KL trips. Shokudo is rated as top on my Best Japanese Curry Rice list! The word Shokudo is referring to the word Canteen in Japanese language, and as how the restaurant was name, the seatings in Shokudo Japanese Curry Rice is exactly the same as how you dine in your school or college canteens. Shokudo is located at the heart of Taman Paramount area and specialized in authentic Japanese Curry Rice that emphasizes in its taste, freshness and every single steps to make sure all the customers are satisfy with their Japanese Curry, which I appears to be one of the satisfied customers. The cream croquettes was really creamy and soft, the potato was blended well that it was smooth on the inside and crispy on the outer layer. It is really the kind of comfort food that people would die for and wanting more. Travelling Around Penang Island Affordably with The All New UberX! 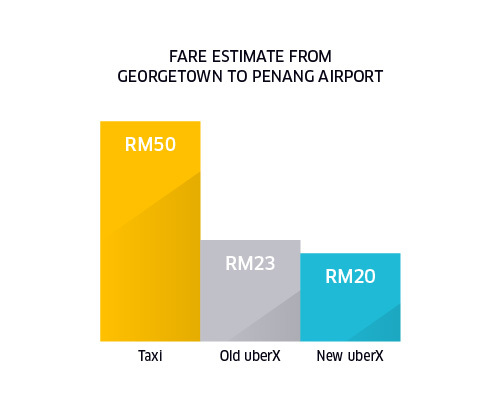 With the recent price cut of Uber in Penang, Kuala Lumpur and Johor Bharu, Uber is now more affordable and convenient to travel around while saving extra cost. I've took a challenge myself to leave my car key at home for a week, hence I have been completely taking Uber for one whole week just to see how much I would spend for the entirely week fully depend on only UberX. The announcement of the new rates attracted more and more Uber users on the road. 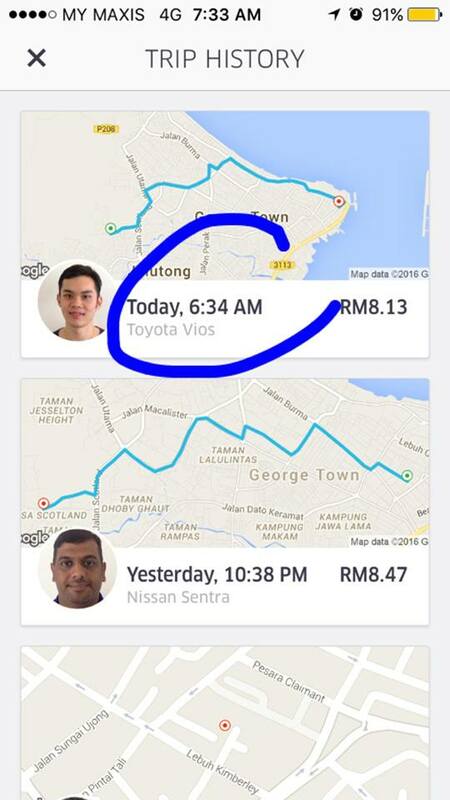 Even traveling from town area to Penang Airport would only cost you about RM20, reasonably cheap and convenient. On the January 25th (Monday) is the day I started to leave my keys at home. 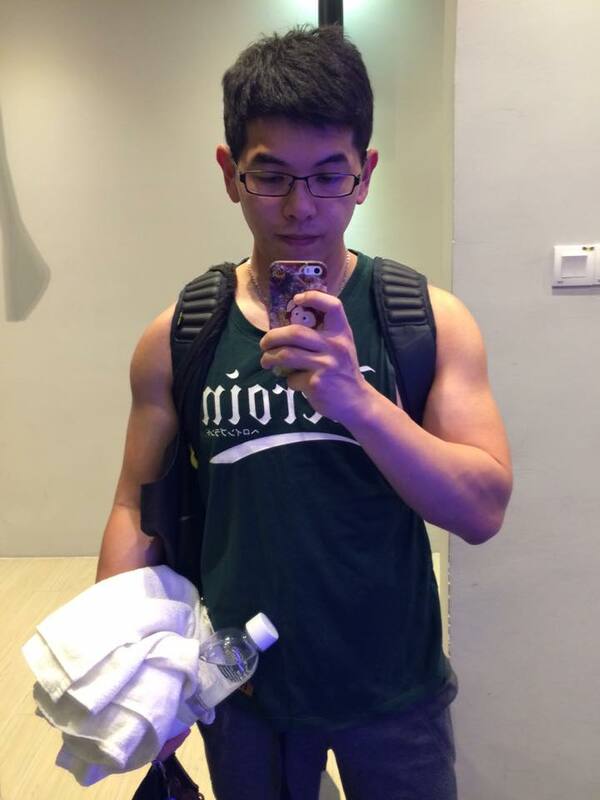 I did not drive for one whole week, fully depended on Uber to travel to work, gym, and wherever I go in Penang Island. I have left my car at home just to test how out much it would cost me for taking Uber for the whole week and the result was really impressive. Getting on Uber, you don't have to worry about the drivers will lost their way to find you. 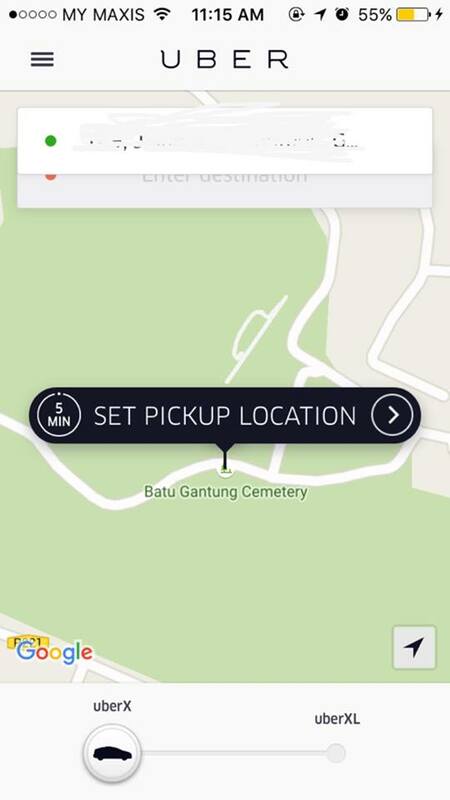 All you gotta do is just request UberX (For up to 4pax) or UberXL (For up to 6pax) from your smartphones, then sit back and relax while waiting for the drivers to arrived at your doorsteps. What's even better are some or most drivers will take their initiative to call you or text your their ETA, or ask for the exact location of your place so that they don't get the wrong person. One thing good about travelling with Uber is, they are exactly your personal driver where you can go wherever you want as long as you get in the car. If you are heading to the mall, or going home and you feel like grabbing some food, or grab some stuff real quick from convenience store, you can just ask the driver to wait for you. There will be no problem at all for them as they will just charge according to the waiting time which is RM0.25 per minute. Worry about your own safety? You can also share your ETA to somebody you trust or somebody who is expecting you. 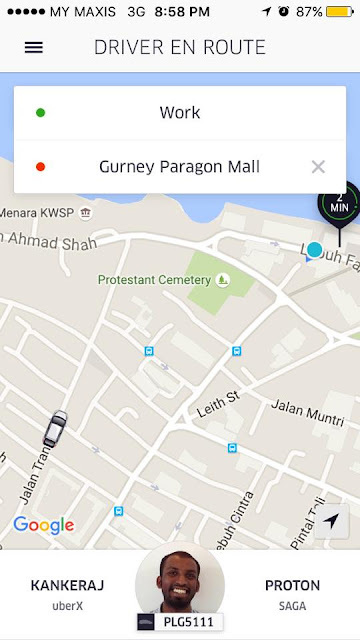 Uber allows this feature to win over the customers' confidence especially those who are taking their rides alone. You can also let people know about your driver's details such as phone numbers, car plate number and many more. It will appear on your screen right after you request accepted by the driver. 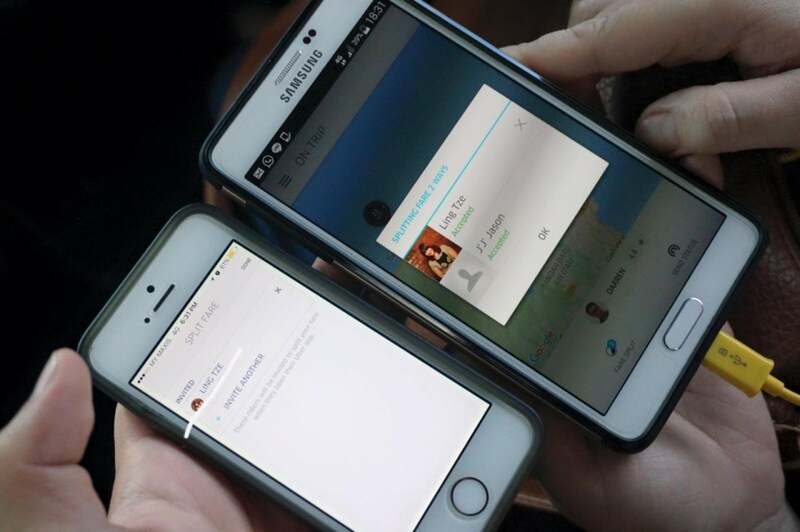 Apart from all that, one of the very great features they have is this Split Fare feature that allows you to split fare with your friends if you guys are sharing rides together. Instead of carpooling, I've went all the way so far to Lone Pine Hotel with Ling Tze for food review. All we gotta do were just sit back, relax and waiting to arrive at our destination. Do have to worry about traffic jam, tired of driving, sleepy and etc. All the drivers I've met so far are pretty friendly and helpful, hence I've gave all of them good ratings. 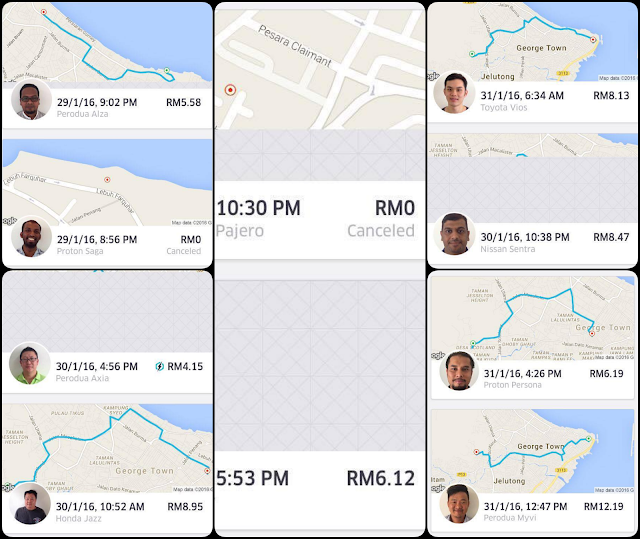 Talk about ratings, you will get to rate every drivers after every of your trip with them. On the last day of my challenge, which is 31st January(Sunday). I gotta get up very early in the morning to go to work at the Occupy Beach Street Event. I was very worried that the price may be vary and could be higher than normal hours. What surprised me was it was still the same rate, the price did not hike for early morning, weekends nor Public Holidays. It was rather lovely to attend to special events having zero worry about traffic jam, limited parking space and also don't have to worry about driving back especially when you are going for a party, or gathering that involves alcohol. Drink and drive is never a practice that we should have as it endangers the live of yourself and also the life of others. Guess how much I've spent for one whole week of traveling only with Uber? You can sum it up from the below prove of my journey. I did let my friends fetched me home for 2 times and hence you can add about RM14 to my total of RM172.39 which is equals to RM187.39. Yes, that's the amount I've spent traveling around with Uber in one week only. You will not expect this kind of price you would spend for traveling around with a personal driver in a week time. Now guess how much are you going to spend if you are taking taxi? 2. Stay calm, you and don't have to be frustrated when you are facing traffic jams or idiot drivers on the road. 3. 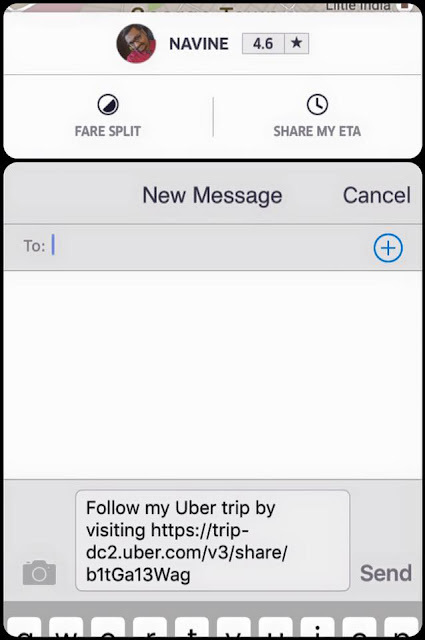 Safe, you can share your ETA with anyone who is expecting you and the drivers' information are all available. 4. Convenient, because Uber drivers are almost everywhere. 5. 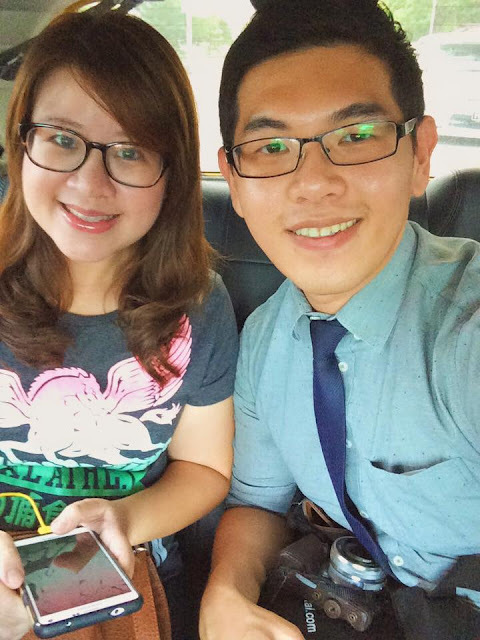 All the drivers I've encountered are friendly and very helpful. 1. If you have different places to go each time, carrying stuff like gym bags and all would be very inconvenient. 2. 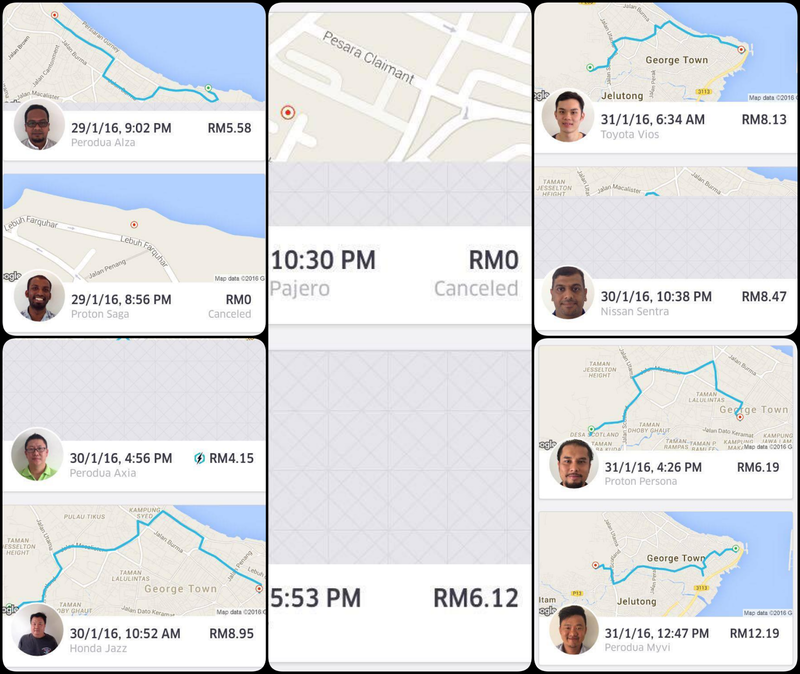 There are Surge Rate(Price Hike) during certain peak periods when demand increases and not enough of Uber drivers on the road. You may have to pay more than usual. GRAB YOUR FREE RIDES HERE! I'm still giving away FREE RIDES! 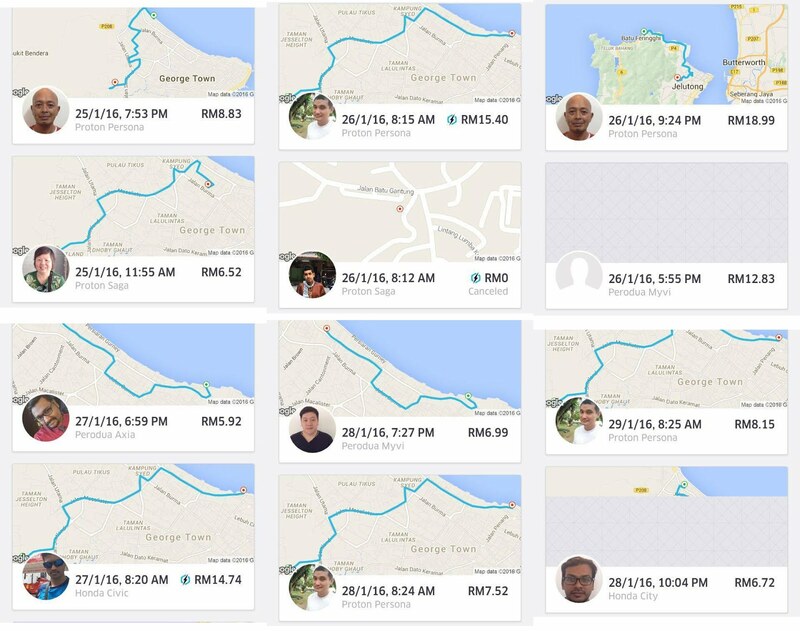 All my readers will entitled for 1 FREE RIDES worth RM20! Here's how you claim your free rides! Standing as an independent and brave woman. Lio Cheung has made it out of Hong Kong and now having her first ever art exhibition in Malaysia. 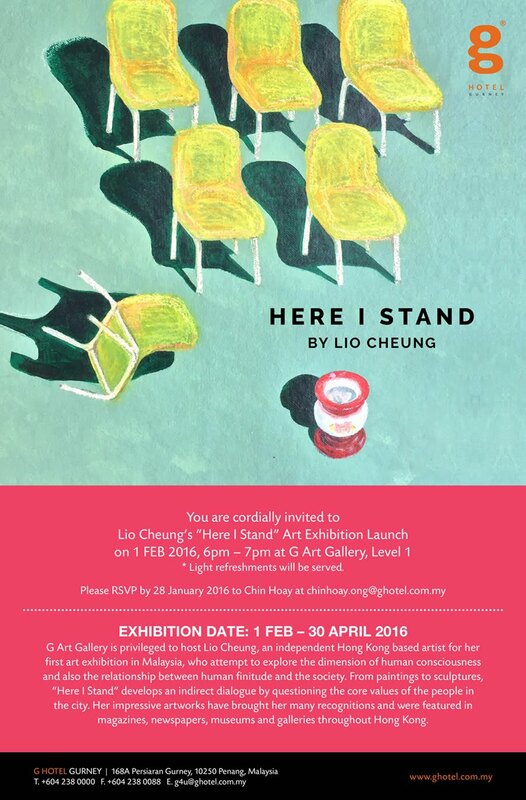 "Here I Stand" by Lio Cheung has officially launched on the 1st February 2016 and will be showcased at G Art Gallery, link bridge at first floor of G Hotel Gurney Penang. It feels good to be back in G Hotel again after quite some time. I arrived quite early and that gave me more time to walk around and enjoy all the masterpieces of Lio Cheung. Lio Cheung is good in using oil, watercolour, mixed media and other materials. She had 4 exhibitions previously in Hong Kong and they were very popular among the locals there. She loves to explore the dimension of human consciousness and also the relationship between human finitude and the society. All the artworks have been hanged nicely just waiting for the VIPs to arrive and launching to begin. That's G Hotel's GM on the left, Mr.Michael Hanrraty, Director of Marketing Communications, Ms.Christina Tan and the artist from Hong Kong, Ms.Lio Cheung. Michael welcomed all the media and guests who have attended the event to witness the launch of this art exhibition by Lio Cheung, which is also the first art exhibition in G Hotel in the year of 2016. 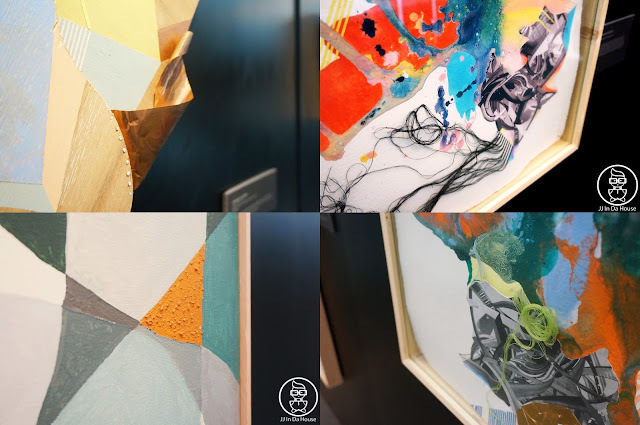 He also said that it is G Hotel's pleasure to welcome Lio, the independent Hong Kong based artist who came all the way to have her first ever art exhibition in Malaysia. Then, the artist Lio Cheung herself gave a speech about how she presented to the world of what affected her life in Hong Kong. Especially how she illustrated her emotions and the soul of the city through her paintings, demonstrated the culture and values of her country. She believed that she can communicate to the world through her art and show the world of the current political situations, the current trends and all other factors that are affecting her life in Hong Kong. Also, we get to witness a great artist demonstrating her skills live during the event. It was such a pleasure to be a part of the media to witness this interesting event. First, she told us that her style is to use mixed media in all her masterpieces. She has prepared partially of her painting before the launching. Then, she mixed some of the colours and media, and started with her painting. Thus, another masterpiece by Lio Cheung has born. She also told everyone that she is very experimental on her arts. She loves to take risk and easy to fall as she always believe that unexpected results will always make things more exciting. Lio Cheung also given one of her masterpiece to Michael as a token of appreciation for hosting the event at G Hotel Gurney. Now, let's run through some of the masterpieces of the Hong Kong artist, Lio Cheung. This is one of my favourite for the exhibition. This piece of art was rather 3D and it gives people a very solid feeling. I'm kinda into this art piece as it symbolises the pride of Hong Kong and also very comfortable looking at it. I believe most of you are quite clear about what's happening in Hong Kong recently regarding the political situations there. And this artwork illustrated the underlying tension in between Hong Kong and China as well as the fundamental reason for the 'Yellow Umbrella Movement"
mix media using wood, plastic and cooper pieces etc. I'm particularly interested in this piece of art as I can feel that there are too much of mixed feelings when life gets too busy. It is always difficult to find a balance in life where there are too many factors that stopped us from enjoying our life. One of the problems that Hong Kong is currently facing is about the lack of land where there are more and more high rise buildings been added into the city. Also shows that the price for properties are only hiking higher and higher that could be very difficult for a Hongkie to own a property in Hong Kong. Another masterpiece of Lio Cheung that uses mixed media to express her feelings towards the conditions in Hong Kong. I really like how Lio Cheung uses all the mixed media to combine into her masterpieces that could bring different meaning and reflect on her hometown. They are extraordinary and also very creative. I really enjoyed myself seeing all the art pieces one by one. Believe me, just look at the paintings and read the descriptions. I'm sure they will be interesting to you too where you can expand your imagination through Lio Cheung's art.I'm really inspired by her courage and braveness to express herself through art and not afraid of being criticize. It was a great pleasure to be able to meet Lio Cheung personally and had a short interview with her. She is really a talented artist who is brave and loves to accept challenges. Her ability to capture abstract through reality has made her a known artist today and also brought her to numerous exhibitions throughout Hong Kong and the first one in Malaysia. She has also been highlighted in many newspapers, magazines and her artworks are also exhibited in galleries, art centres and museums in several places. 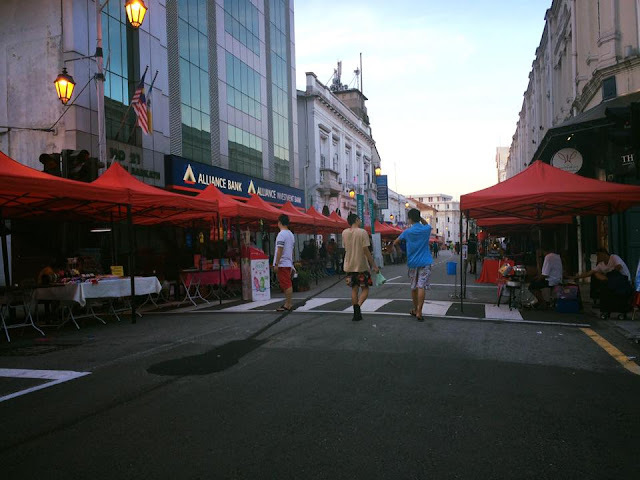 Lio Cheung is really friendly and also ready to answer all questions regarding her artwork. She was happy that she has finally made her first art exhibition out of Hong Kong and hoping for many more to come in the near future. She also felt thankful for all the art enthusiast who appreciated her artworks. She believe that she can communicate to the world through her art and let the world know of what's affecting her daily routine in Hong Kong. Lio Cheung "Here I Stand" Art Exhibition is now happening at G Art Gallery, 1st floor of G Hotel until 30th April 2016. Do hop over and indulge yourself in Lio Cheung's art. 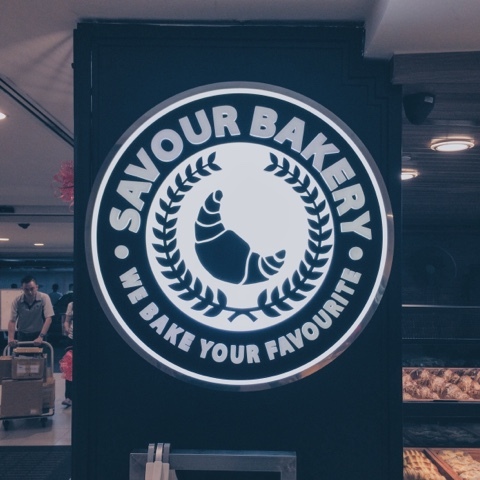 Recently joined the pastries market and positioned as one of the better quality breads with higher price range, Savour Bakery has recently opened in Gurney Plaza located at the Basement Floor next to Watson store. 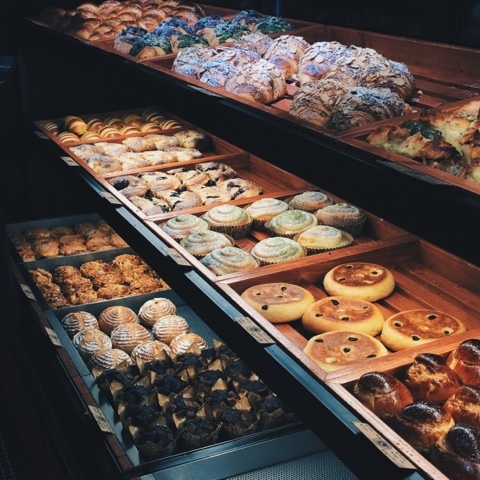 The moment I came near to the shop, I was really attracted by how they displayed their breads on the display rak. And also the presentation of the breads that can really attract crowds to look at it even if they are full. 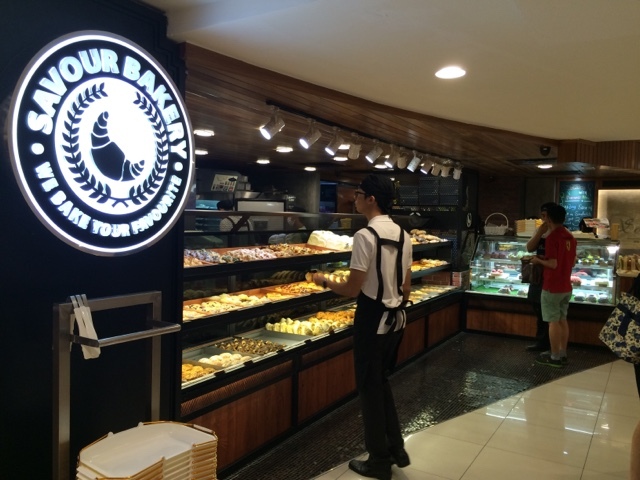 Located next to carpark entrance, Savour Bakery is not difficult to find if you step down to the Basement Floor of Gurney Plaza. This is how their breads were displayed to the public. All of them look really attractive and tempting. Which is why they can attract even people who are not really into breads like me. but I can't help myself and grabbed some of the breads for my tea break. Anyway, I didn't regret my decision. I got myself a delicious looking Maisano Corn Cheese (RM5.80). This is the bread that attracted me the first as I'm someone who is really into Maize Bread (corn bread). It smells really good and when I found out that inside has got cream cheese filling, I was really flattered by it. 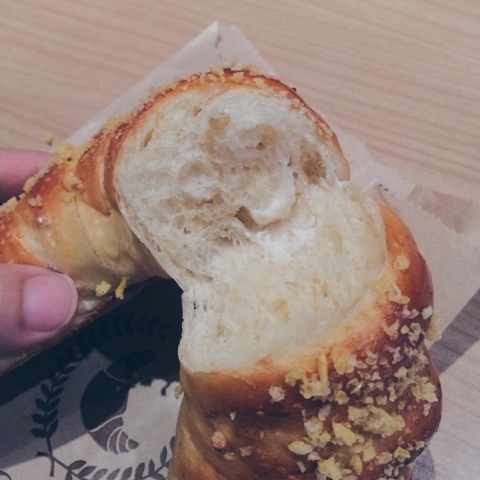 I really like the cream cheese filling and it was perfect for a cheese lover like me. 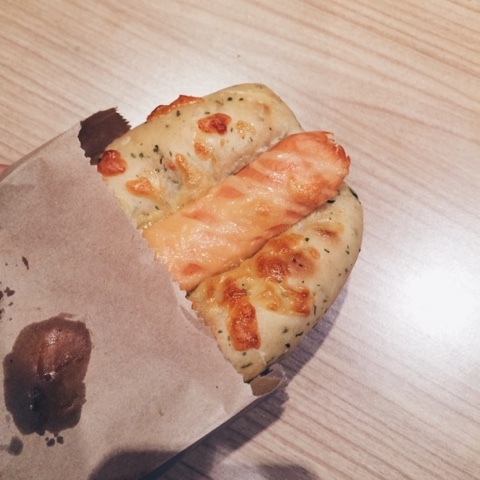 I didn't regret choosing it as it is really good, crispy on the outer layer and soft dough inside, it was baked to perfection that I enjoyed every bite I took. Then I was also attracted by Focaccia Jumbo Potato (RM6.80) that comes with a whole Jumbo Chicken Sausage. It was rather delighted to find a whole sausage instead of half sausage like that most bakery did. It is the herbs that made this bread rather delicious and also the potato that made it rather filling. The size of the bread will be sufficient for a lady for a meal. 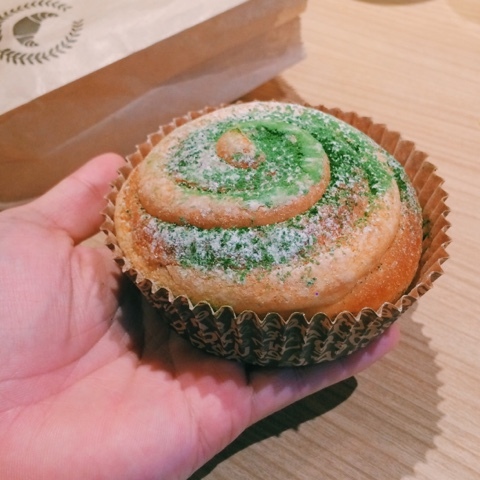 The last bread I choose was this cute looking Brioche Matcha (RM3.80). 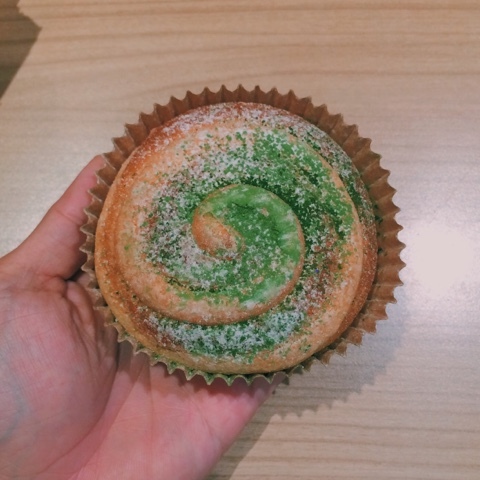 To me it looks really cute and I thought of having it for the sake of the matcha powder but I never thought it was actually the best among the 3 breads I picked. Let's talk about the outer layer first. It was slightly crispy and the sugar icing have blended well with matcha powder that it removed the bitterness of matcha but making this bread rather delicious. Also not forget to mention that this bread is also filled with my favourite cream cheese that made me fell even deeper for this bread. Thumbs up and highly recommended! 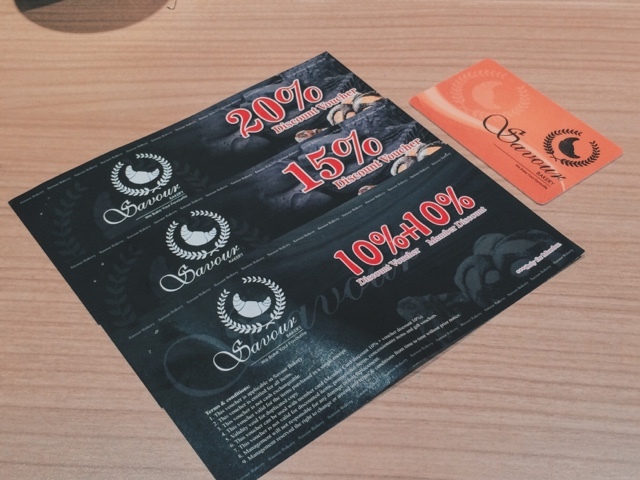 Apart from that, I've also grabbed myself one of their membership cards that entitled me for 10% discounts on my every purchase and also 3 pieces of discount vouchers from 10% to 15% discounts. Also you will be entitled to their happy hours promo from 9:15pm to 10:00pm daily. 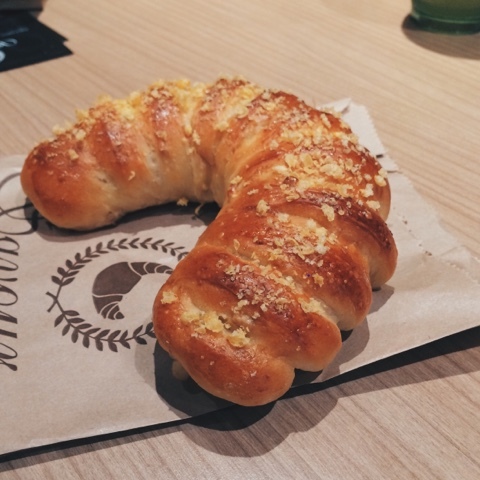 With the recent pastries trend in Penang. 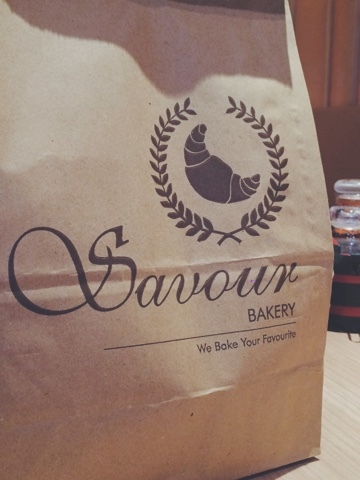 Savour Bakery entered as a strong opponent and ready to challenge the market with their quality breads. Other than breads, cakes, coffee and other drinks are also available at the shop.